As 2016 ends and we look ahead to the challenges of 2017, I want to pause for a minute and share with you some encouraging news for the future of the Arctic. Pacific Environment has been campaigning for a fossil fuel-free Arctic for nearly a decade, together with many environmental groups, community allies and supporters like you. The hard work helped produce an important joint announcement last week by President Obama and Canadian Prime Minister Trudeau. The item in the announcement that received all the press attention was the protection of the U.S.- and Canadian-controlled parts of the Arctic Ocean—including fragile coastal waters—from oil and gas drilling. Obama protected millions of marine acres from Big Oil by permanently withdrawing them from future oil and gas leasing, using the authority granted him under the Outer Continental Shelf Lands Act. Five years ago, during the most intense moments in the battle against Shell Oil drilling off Alaska, many said that drilling was inevitable and that environmental groups could do nothing more than fight for best practices. A few voices, including Pacific Environment, said that the ultimate goal had to be a ban on all drilling to protect oceans, wildlife, communities and the global climate. Last week’s announcement affirms the wisdom of boldness by activists. We and allies are now gearing up to fight attempts by the Trump administration to open up America’s public lands and waters to Big Oil. But the Obama-Trudeau announcement did much more than protect Arctic seas from drilling. The two leaders announced major moves toward a clean energy economy in the Arctic—moves that track what Pacific Environment and allies have been advocating. The United States and Canada agreed to start the process to phase out heavy fuel oil in Arctic waters. Even if there were no oil drilling at all in the Arctic, a huge threat of oil spill disasters comes from supertankers (like the Exxon Valdez) and other commercial ships—too many of which still use or transport heavy fuel oil. This oil is super-dense and impossible to clean up in Arctic conditions. A spill would be catastrophic for communities, wildlife and ecosystems. And I’m proud that because of Pacific Environment’s leadership, this issue has risen to the top of the Arctic policy agenda. 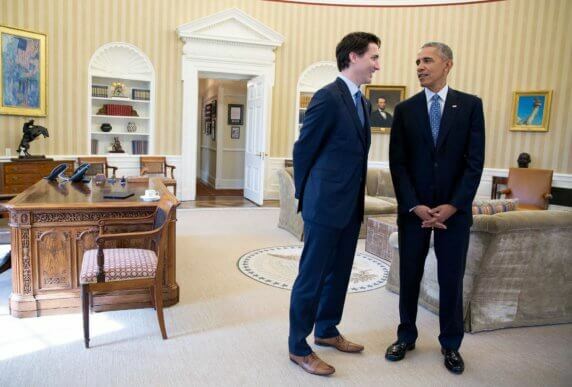 Obama and Trudeau did more still, announcing common-sense ship traffic regulations. In the face of a huge increase forecast for Arctic ship traffic, the two nations committed to various protections for indigenous communities and wildlife, including ship “avoidance areas,” speed limits and shipping lanes. These measures will prevent collisions and steer ships away from dangerous areas, breeding and migrating wildlife, and indigenous subsistence activities. Finally, the item that may prove to be the most important for the ultimate success of Arctic protection was one hardly noticed. Obama and Trudeau announced measures to support indigenous economic development without fossil fuels and to include the voices and full participation of indigenous communities in that economic development. Climate change and the anticipated increase in ship traffic are threatening the survival of Arctic indigenous people whose lives are inextricably tied to the bounty of the sea. I’m proud that Pacific Environment has been partnering with indigenous leaders to help them gain a seat at the most important international institution for Arctic waters. From securing new international laws for Arctic waters (an historic achievement that many had deemed too big a lift) to an ongoing campaign for marine protections in the Bering Sea, Pacific Environment has been fighting to protect the fragile Arctic, its people and wildlife from a threatened onslaught of industrializing activities. Ultimately, the long-term health of the region will require strong protections from the potentially devastating impacts of increased ship traffic and a just transition from fossil fuels to clean energy. Yes, the new Trump administration is littered with climate change deniers and fossil fuel acolytes, posing a threat to all these recent achievements in the Arctic. But I’m heartened because I know that people here at home and around the world are way ahead of the new administration’s dangerously outdated fossil fuel agenda. From key industries to faith leaders, more and more folks across partisan lines are realizing the existential threat climate change poses to our lives—and they will be demanding action for a just transition to clean energy. Pacific Environment has been working in politically challenging conditions around the Pacific Rim for decades. Our partners in China and Russia show us how much can be accomplished through the vision and determined action of grassroots leaders. Our partners’ courage in the face of political repression inspires me every day, and it gives me strength to continue the fight for the Arctic and our future. I hope they will inspire you, too, to face 2017 with boldness and courage. Let’s make the environmental movement even stronger together.